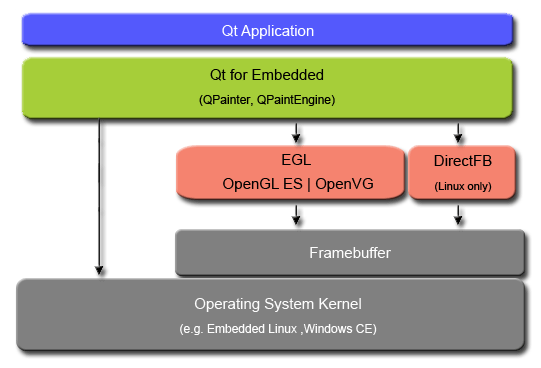 Qt for Embedded Linux includes its own windowing system, QWS. QWS was designed in 1999, well before graphics acceleration was available for embedded devices. It does a great job providing a lightweight window manager including all the expected functionality such as arbitrary windows that can be moved, resized, minimized, etc. Getting QWS to work with GPUs is very challenging, particularly with OpenGL and OpenVG because there is no standard way in Linux to share textures across processes. Some silicon vendors provide private APIs to allow texture sharing, others do not. These limitations are documented under the sections describing each type of accelerated hardware APIs. The simplest most generic support for accelerated graphics is a full screen single process single window. QWS, not accelerated, allows arbitrary windowing with multiple processes drawing on the screen. X11 with an accelerated X11 driver provided by the silicon vendor. Like QWS, this allows arbitrary windows with multiple processes drawing on the screen. Our experience is that there is some overhead from X11 which will adversely affect framerates. Additionally, our experience is that the drivers from silicon vendors are still maturing. Full screen single process single window. This will always work. Some additional capabilities are available and are documented in the acceleration specific API sections. This table shows which Hardware Accelerated Graphics APIs currently supported by Qt.